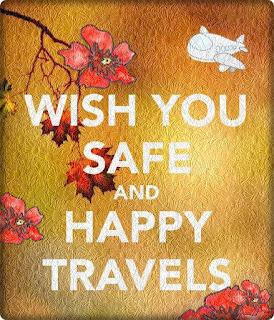 Everyone likes to wish happy and safe journey wishes to their loved ones and these quotes will definitely convey your message in a decent way. Sometimes a simple looking trip does not go to the swift, but to those who keep on running their tracks with ambition and do not give up. Sometimes it seems like where we are going and what we are doing is of no value, but every journey brings a lot of lessons in our life and I want to encourage you to continue your travel because your destination is coming in. Share these safe journey quotes to your friends, lover, husband and colleagues on Facebook and let show your presence with them. Beautiful eyes see beautiful things and an amazing girl like you shall always meet amazing people along the way. May your journey keep getting better and better and the smile on your face never fades away. Your journey might be cruel and hard, life might be bitter, but there are lives around each corner of your life. Your happiness is mine as well. Have a safe journey. Today is the day to start something new. Trust in the possibilities of new beginnings. 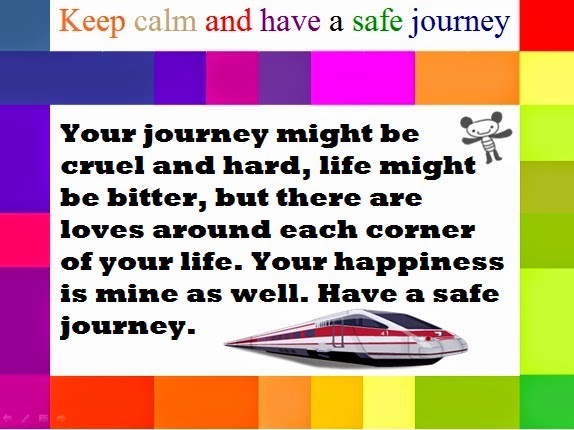 So keep calm and have a safe journey. I am really so happy for my dear, your dream was always discovering the world, make it unforgettable holiday dear, have fun. No matter where you may go, the moon will always be there to follow you. I miss you and praying for your safe trip. I am so excited for you .Once the travel bug bites it never stops biting, believe me. Have a wonderful time. Never mistake your dreams with your fantasy. Looking forward to receiving God's word! To know you is to love you, and I know you lots and lots. Always be happy, be gentle to live and to your heart. Always be true and embrace life even more. I pray for your safe travel. Enjoy your time there. And please try to have a lot of fun. I miss you, but very happy for you. The obstacles you face in this journey are nothing more than mental barriers and they can all be broken down if you think more positively. In your mind, see what you want to happen as opposed to how things are. Think, visualize, and then step forward. Destiny is like an alarm clock when the time comes it rings. No matter how you try to move faster, when your time has not come, you may spend more years in the wilderness. It doesn't matter where we came from, what matter is where we want to look forward. I wish a happy and safe journey for you. Even if you trip and fall, never run away from life, run towards it, find resilience in your pursuit of happiness. You can't move on with your life until you leave your past life be hide. Leave the hurt you had as a child and your past bad relationships that hurt you. Every day you need to take a step in the direction of Mental Freedom and it still will be a lifetime journey. Most times the mindset that is the worst for you is the one you gravitate towards the strongest. You must go to stay focused and clear headed. When you travel like you're on top and people are waiting for you to fall. Remember how great you are and all the things you've achieved. Life is a journey, people you meet in life are stations sometimes you spend much or less time on particular. If you try to spend much time then you will miss your next. So be positive, go ahead, next station waiting for you. We all have unknown gifts, talents, and skills, the only way to discover them is by getting out of your comfort zone. Best of luck for your first plane journey! It's amazing how much better life gets when you follow thru with your plan to make life better. I wish you may collect more happiness and more memories on this journey. 1- It’s the end of summer vacation trip and the beginning of another school year. It's an exciting time for everyone. The start of a new year, new friends, new teachers, new classes, but one thing stays constant, learning. Always be prepared to learn something new. They say you can't teach an old dog new tricks. This isn't true. You will learn something new every day if you allow yourself to. 2- There really is no good time that is wasted; even down time when you are just relaxing or vacationing has a purpose. Make the most of your days and stop spinning your wheels on things that don't deserve your attention. Far too often we get lost in the back and forth 100 mph days where at the end of the day we look around and are clueless with what we accomplished. Take control of your schedule and make sure your days are productive. Have a safe trip my friend! 3- Your life is a prepared table. Do not allow people to sit anywhere. Create the chart and assign the seating in your life. Have a safe trip back home! 4- Never be afraid to leap to the other side. Sometimes you have to leave the familiar territory and friends as the environment can become crowded and noisy. Take the leap and have no fear of being alone. That's when you gain room to move around and grow. Enjoy your flight, my prayers will follow you in your whole journey! 5- Never try to negotiate your way into someone's life. If the front door isn't open, don't attempt to go through the window. That's how you become injured. Accept my humble prayers for your safe flight. 6- Stop taking chances with giving people more chances than they deserve. Each time you allow mistreatment to be covered with a lifeless apology; you condone and pave the way for your unhappiness. Bon Voyage honey! 7- No one needs to experience all of you without first knowing and committing to you. Enjoy your holidays on this amazing forest trip. 8- Broken people will never make you feel whole and complete. That's your responsibility. Own it. 9- Be intentional with your time and with whom gets your time. There is no such thing as spare time. Time is your life. You don't have a spare life. Bon Voyage! 10- When you become comfortable, you will begin to conform to what is normal as opposed to what is exceptional. You have to develop and nurture your gift. My prayers are with you in this adventurous road trip. 11- People who do not have good intentions for you are hoping you never realize your value. When you associate with them, you prove them right. 12- Many people have missed good days by waiting on someday. Never waste your days on someone who refuses to include you in theirs. Have a super fun trip. 13- Learn to celebrate the life you have and the life you want will become your reality. I wish you really enjoy your first flight outside the country. 14- No one comes into your life saying I'm here to make your life a living hell. But sometimes they SHOW you little by little that their purpose is just that. 15- Some people will be attracted to your progress, but shun your process. They get hyped at your testimony, but would fail the test. They love the idea of you, but can't handle the reality of you. Some will only want to share in your praise and sit with you on grand stages. Do not allow people to pimp your praise. Enjoy your trip and back home safely. Safe Journey Wishes to Brother! 1. Life is one endless journey to try to reach the top. Some never reach the peak. Some give up trying and slowly head back to the bottom. It is with constant hard work and effort that allows you to move up the mountain. Sure you can take days off here and there, but if you want to reach the top, you can never stop moving. There will be easy days and there will be tough days. You have to find the happy medium in life and keep pushing on. Find your balance and don't stop the journey until you reach your goals. Bon Voyage! 2. Just because we have different ways of starting a journey doesn't always mean we can't achieve the same goals. If you are doing the same thing every day and never changing you will become a number. Differentiate Yourself and Don't Be Afraid To Be Different. All my prayers are with my sweet brother throughout his journey. 3. You have to learn in life that we won't have control over everything in life, but you can control how you react or handle a situation. When you feel a big cloud of pressure coming and you know it could potentially cause problems, prepare as best you can for it, and plan how you are going to handle the storm. Life isn't easy and you will constantly deal with pressure in your life. Have a safe journey, dear brother.